Latest UV Tanning Equipment including the BRAND NEW Luxura Vegaz, Luxura X10, High Pressure X6 stand, Premium V8 & V7 stand and a Coll-tan bed! 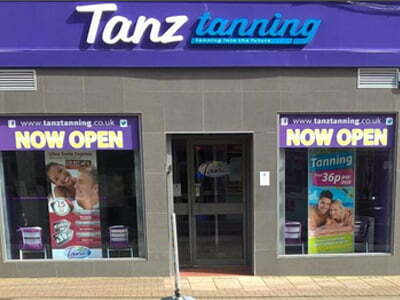 Tanz Professional Tanning and Slimming Salon in Ayr is fully equipped with sunbeds and high-speed vertical tan stands which feature the latest, state of the art, sunbed technology. Tanz in Ayr also features the World’s Number 1 Spray Tanning Booth – giving you a perfect, moisturised spray tan in only 3 minutes. To make an appointment at our Ayr tanning salon or for pricing information, simply call us on the telephone number or pop in to the salon in person, for a friendly chat about the products and services that we offer including a variety of self tanning and slimming options.